During her sixth year at Our Lady’s HS, Gemma was one of the pupils selected by Mrs Letham (PT Social Subjects), to represent the school on a one day trip to Poland to visit Auschwitz Birkenau. As part of her reflection, Gemma wrote a essay called “Hannah” in which she focused on the story of one small child whose name she noticed on a suitcase. Subsequently she worked with Mrs Millar (PT English) and Mrs Macfadyen (LRC Manager) to hone her work for the Scottish Schools Young Writer of the Year 2015 competition, which she went on to win. As a result, Gemma was invited to read her essay at the event on Tuesday night in front of an audience who included MSPs, representatives from the Holocaust Trust including Holocaust survivors, the Press and representatives from Our Lady’s including Headteacher, Mrs Sinclair, and most importantly her proud parents. The evening closed with a speech from First Minister, Nicola Sturgeon, who was highly impressed with the quality of Gemma’s written work and her presentation. Classrooms for Malawi came to talk to 4th year pupils about their work. Charity Co-ordinator, Tony Begley, accompanied by OLHS former pupil, Daniel Canning, explained their beginnings from Mary’s Meals. Pupils watched a video, seeing the conditions of some Malawian schools: children trying to learn in blazing heat outdoors, or subsequently unable to attend school in the rainy season, and classrooms crammed with fifty or sixty children. They also learned how the community is totally involved in the creation of new classrooms, raising some of the total cost, and providing skilled workers. OLHS and Classrooms for Malawi are now investigating ways of working together. There is a committee of former pupils, teachers and former teachers who meet at least once per year to discuss the upkeep of our Chapel. The concept of the Memorial Chapel was started in the old Our Lady’s High School and was planned as a memorial to the young men who were pupils and gave up their lives in the Second World War. When Our Lady’s merged with St Joseph’s the fallen from St Joseph’s were also remembered. 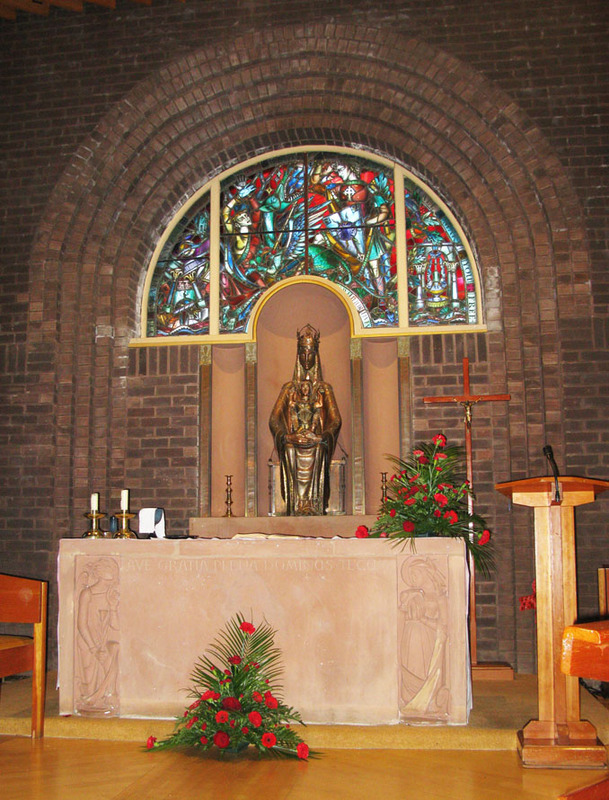 The altar, the Marian Statue and the art work were all transferred from the Airbles building in the 1970’s after our Chapel was built. Pupils in the school at that time raised a phenomenal amount of money to ensure that the Chapel would be built. The statue is now in a state of disrepair and the War Memorial Committee have been involved in fundraising for a few years to pay for the statue to be repaired. As well as this, they plan to upgrade a number of things in our beautiful Chapel. Today the statue is being taken away to have the repair done by experts in the field. We look forward to seeing the statue returned to its former glory in the near future. The Truth about Youth Awards were held in the Glo Centre in Motherwell on November 6th. Hosted by Motherwell Voice, the Awards celebrated young people’s involvement in learning, citizenship, sport, health, entertainment and volunteering across their communities. Seven young people from a shortlist of thirty won awards, including several OLHS pupils and former pupils. For more information, please see the video below. Our annual Awards Ceremony was held on 18th September with our special guest, composer and former pupil, Patrick Doyle, presenting the awards. Mr Doyle was most complimentary about the performance of our choir and school band and has provided funds for an award for Best Performance in Middle School. S5/6 pupils studying Higher History attended a lecture by Professor Tom Devine in Glasgow which was streamed live throughout Scotland. Professor Devine is a former pupil of Our Lady’s High School and it was a great honour for our school to be asked to open the lecture on behalf of the Royal Society of Edinburgh. Many thanks to our captains, Mhairi Duncan and Daniel McDermott, who were outstanding in their opening address. The topic of the lecture was The Scottish Diaspora and pupils found it interesting, informative and of great benefit for their Higher History course. Our thanks also go to Siobhan Kennedy and Garry Duffy who asked the Professor some searching questions. The lecture can be watched again by clicking here. Former pupils Kenneth MacDermid and Colum Martin took part in a question and answer session with the entire S6 class. Both Kenneth and Colum joined the Seminary last year and are now on their way to become priests. Kenneth and Colum were asked a variety of questions and shared their personal experiences of being trainee priests, living and studying in Rome and how their lives have changed since joining this particular faith path. Kenneth and Colum also visited Miss McGinness’ and Miss Kane’s S2 RE classes to talk to the young people about what it is like to be in seminary and how they came to the decision to train to become priests. Were you a member of the Our Lady’s team which won the Scottish Senior Shield for the 1999-2000 season? If so, you’re invited to come along to join the fun at our reunion party on Saturday 8th May, 3pm at The Tavern. Looking forward to seeing some familiar faces. Pupils are continuing in their Lenten fundraising efforts and were particularly generous in ‘Guessing the Easter Bunny’s Birthday’, an activity organised by pupils of 3A. The total raised was £65.85. Pupils will have to anxiously wait until the last week of term when bunny’s birthday will be revealed at morning assembly. 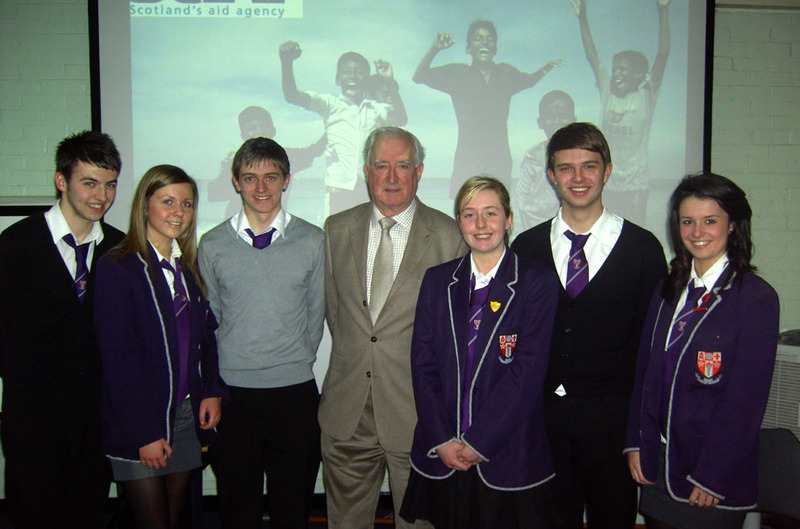 In addition to their fundraising efforts, pupils were also given the opportunity this week to learn how their donations make a difference to the lives of others when Mr Harry Doyle of SCIAF (and also former pupil) visited the school and delivered a presentation to S1, S2 and S6 pupils. SCIAF is the principal recipient of our Lenten funds while other charities are nominated by pupils through their pupil councils. The Annual War Memorial Mass took place last Thursday. Seventy family and friends of young men from Our Lady’s and St Joseph’s, who died in the Second World War, came along to our beautiful Chapel to remember them. Bishop Devine concelebrated the Mass with the school Chaplain, Fr Frank King and Father Jim McGarry, SDS, whose uncle was one of those who died. Pupils from the school were involved in the Mass, which was planned by Mr Mathieson. Rebecca Salemi, Martin Ward and Katie McElhinney read out the names of the deceased in a very moving ceremony. Friends and family were then invited to the staffroom, where they were served refreshments by one of the Personal Development classes. Guests were once again moved by a very interesting presentation on a recent trip to Auschwitz- Birkenau by Collette Maguire and Andrew Dunn. Their photographic presentation captured the atmosphere of the camps and delivered a very important message. The AGM of the War Memorial Chapel Trustees was held after the reception. The well-deserving recipient of the Maltman Bursary 2008 is Kathleen McMurray. Mrs Catherine Maltman set up the bursary to provide one student from Our Lady’s and one from Braidhurst High School with £1000 for each year of their university course. The Our Lady’s candidates were selected for their outstanding results over 5th and 6th year, and while all three gave good interviews, Kathleen’s was outstanding. Many thanks to Mrs Catherine Clarke from Braidhurst for her excellent interviewing skills. 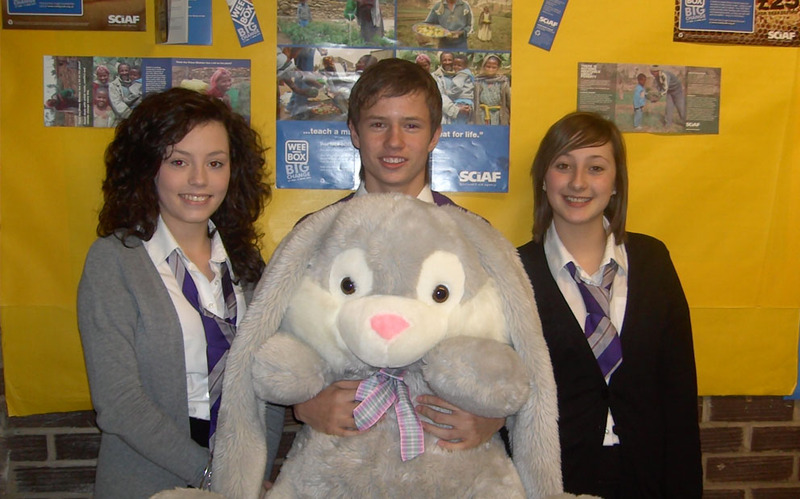 The Art Department welcomed back former pupil, James Gardner, today. 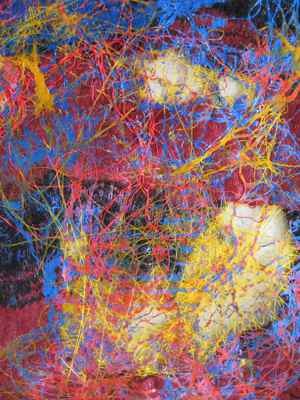 James is in his final year at Gray’s Art School, RGU, Aberdeen, studying textile design. James offered to come along to OLHS to share some of his expertise with our current pupils. Classes had a chance to see his own textile designs, including woven textiles, computer generated designs and silkscreen prints. In addition, James kindly demonstrated some techniques working with batik wax and drawing with their opposite hand (i.e. with left hand if right handed and vice versa) to create original artwork. Every class was enthused by James’ work and demanded that he return as soon as possible. Most classes were so motivated that they took their work home that night to complete it in their own time.